I have learned in life that before you criticize someone — and the Bulls probably deserve their share after their shockingly poor effort Wednesday in a 121-79 loss to statistically the worst defensive team in the NBA, the Sacramento Kings — you need to walk a mile in their shoes. That’s advisable, by the way, because then when you criticize them you’re a mile away and you have their shoes. C’mon guys, lighten up. It’s just one game. You can’t get blood from a stone. Or is that a turnip? I mix them up. But you can also only get so much production from a team not only with its former MVP out all season, but still without three of its top six players in the rotation in Kirk Hinrich, Richard Hamilton and Taj Gibson. It’s no coincidence the Bulls have failed to shoot better than 40 percent the last four games, why they’ve lost four of five to fall to 35-29 on the season and why they’re averaging 83 points the last four games and 87 points the last nine games to fall to 29th in the league in scoring ahead of only the Wizards. “Just the fact that we lost was embarrassing,” said Carlos Boozer, who led the Bulls with 21 points in a game that was over midway through the second quarter as the Kings went up 30 on the way to a 45-point lead. “It’s hard to put in words. We just have to step up more. We got a lot of people out. When you have people out everybody has to play a little bit harder, do a little bit more. We know that we’re capable of doing that because we’ve done it before. But we’ll have a quick exit if we’re playing like this in the playoffs. I know that’s the no excuse hymn the Bulls always repeat after games like this even if there hasn’t quite been one like this since Tim Floyd was coming up with the explanations. But there’s just not enough there to sustain over this long a season. When the game began to get away in the second quarter, Thibodeau signaled down the bench for… Daequan Cook. So the Bulls have to endure for a bit and take their bumps. Hinrich, Hamilton and Gibson will be back, perhaps in the next week or so, maybe even someone Friday in Golden State. No one knows about Rose as he said Tuesday he’s getting closer but not ready. Which changes the debate every day. Should he come back to save the team? Though he can’t as he’ll be on limited minutes the rest of the season if he does return. But with so many players out, is it then too risky to have him return as he’d then be asked to do too much. And that seemed to be what occurred last season as he kept coming back from injuries too soon with players out and kept getting hurt again. Noah knows. But what can he say? What can anyone say? He looked in the mirror and it was cracked, also. The schedule maker is relentless, and Noah and Luol Deng, the latter with 10 points on five of 12 shooting, have been brilliant competing this season. 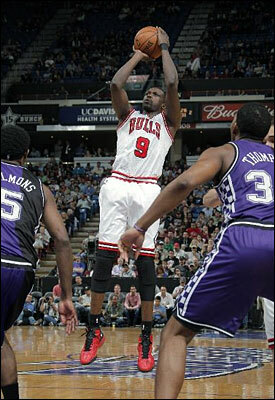 Both became All-Star selections by the coaches and remain in the top 10 in the league in minutes played, Deng still No. 1. But what else was there to do? Yes, Thibodeau gets questioned often about minutes played, though the Bulls might not even be in playoff consideration without Noah and Deng playing as they did. But then to have them continue without the support of half the top six players and the team’s only true playmaker in Hinrich causes an inevitable strain. The Kings, particularly because DeMarcus Cousins was out with an injury, were able to take advantage playing smaller, spreading the court and going with their athletic guards and wing players, who were too quick and too much for the half court Bulls. Tyreke Evans got 26 points and seven assists and Isaiah Thomas 22 points as Nate Robinson had 19, but Marco Belinelli was scoreless and zero for nine shooting. Jimmy Butler was two for 10 and Cook was one of five before some late baskets when the Kings were leading by 40. Though it seemed clear from the comments of the players they were thrilled to be playing without Cousins, who sets up in the post, holds the ball, takes bad shots, commits lazy turnovers and generally is always on the verge of attacking someone to the point you can tell it unnerves teammates. Yes, the Kings are for sale, and they could move to Seattle. That decision will likely come next month, which would make it the Bulls last game in Sacramento if they left. Nice bon voyage gift for the fans. It was by far the Kings best game of the season playing with an active lineup that had Jason Thompson starting at center and Patterson at power forward. It was a lineup that gave the Bull fits even as they hung in awhile, leading 16-15 with 4:58 left in the first quarter before a 13-1 run basically ended the game. The Kings led 34-20 after one and opened the second quarter with a 21-4 run to take a 55-24 lead with about five minutes left in the first half. So you also wonder if the Kings have had enough of Cousins, an amazing talent who has been more destructive than helpful in his tenure with the Kings. Cousins has fabulous skills for a seven footer, the profile of a potential star. Though he seems to have destroyed this Kings team that was so energetic and solid without Cousins they didn’t commit their first turnover until late in the third quarter (five overall to 17 for the Bulls) and were constantly beating the Bulls to the ball, even to rebounds for the 26th ranked rebounding team and for fast breaks as they had 27 fast break points, a rarity against the Bulls. Figure with Cousins the Bulls at least would have shot a few more technical free throws, though Robinson got one when his fellow mini buddy, Thomas, taunted him after a three-point play late in the first. The Kings did a lot of posing after shots and dunks as you know they haven’t been in that position before at 43-23. The Bulls shot 38.6 percent and scored 79 points against the team ranked last in the NBA in points given up and 29th in opponents’ shooting. The Bulls went after people. Right after the Kings scored they got the ball and inbounded it. You try to put them in position to make shots, get better ones, defend their position. But you can’t make them better and you can’t make them healthy. This is not a Bulls team, as we’ve seen clearly the last three seasons, that doesn’t compete, that is without pride and determination. They won’t lay down, though if you were to offer them a cot for a short nap you’d assume they might find the time. They pushed through the season and got 11 games over .500 at the end of January. It was impressive without Rose and with Hinrich and Hamilton going down sporadically. But when they get joined by Gibson that demands a deeper bench than Thibodeau generally cares to play. You can say he should have played Marquis Teague and Vladimir Radmanovic more for times like this. But then maybe they wouldn’t have nearly as many wins to try to hold off the Bucks and avoid the final playoff spot and a first round series with the dominant Miami Heat. The playoffs is almost assured with the Raptors and 76ers continuing to lose. And it’s not like the East is a menace beyond Miami. The Knicks got blown out again Wednesday and Carmelo Anthony, Amar’e Stoudemire, and Tyson Chandler are hurt. The Hawks had lost seven of 10 before holding on against the Lakers Wednesday. The Celtics were blown out by the Bobcats. It’s that time of year for everyone who doesn’t have transcendent stars. It happens. They are not machines, and with the playoffs basically assured, it’s difficult, and perhaps unnecessary, to push that much harder at this time. Though that’s not in the DNA of these Bulls players, and certainly not Thibideau. Which is why you so often are proud of this Bulls team. But like with your child, some days you need more patience and caution. Some days you don’t want to test the water’s depth with both feet. There’s not much to break down in this one other than an issue the Bulls have been fighting without Gibson. The Bulls play the slower Boozer against the lesser scoring front court player and Noah against the higher scorer or more versatile player. So Noah had to take the perimeter oriented Patterson while Boozer was on Thompson. The Kings cross matched it so Patterson had Boozer, and Boozer had his way early with 11 first quarter points. But that drew Noah away from the boards chasing Patterson outside. That also opened the lanes for the Kings to penetrate and finish or kick while Boozer isn’t much of a help defender. But the Bulls needed to stick with Boozer for scoring. Thus it was a compromised defense from the start with the Bulls scrambling without their usual energy and the Kings shooting 65 percent in the first quarter and 58 percent with a monstrous 65-36 halftime lead. There was a 52-14 Kings run in there, which is never very good. 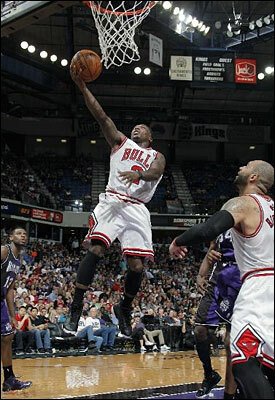 The Bulls did cut a 44-point third quarter deficit to 31 with about eight minutes left in the game. Yes, that was a highlight. So if you’re going to steal your neighbor’s newspaper, that’s the best time to do it. And that would save them also reading about this one.